(Phys.org)—A team of researchers from Poland, Spain and Austria has discovered that brown bears living in Poland have glands in their paws that produce chemicals that the bears use to communicate with other bears. In their paper published in Scientific Reports, the team describes their study of multiple bears in the wild and what they observed. As the researchers note, many animals both on land and in the sea use chemical signaling as a way to communicate with one another. Such chemicals when dispersed into the environment can be used by others of the same species to learn about the animal that left them by simply sniffing them. Prior research has shown that brown bears are typically loners who establish large territories. Such a lifestyle would seem to suggest the need for long range communications—to let other bears know of territory borders, occupant age, gender, etc. Also, there would be a need for females to signal males when they are ready for mating. 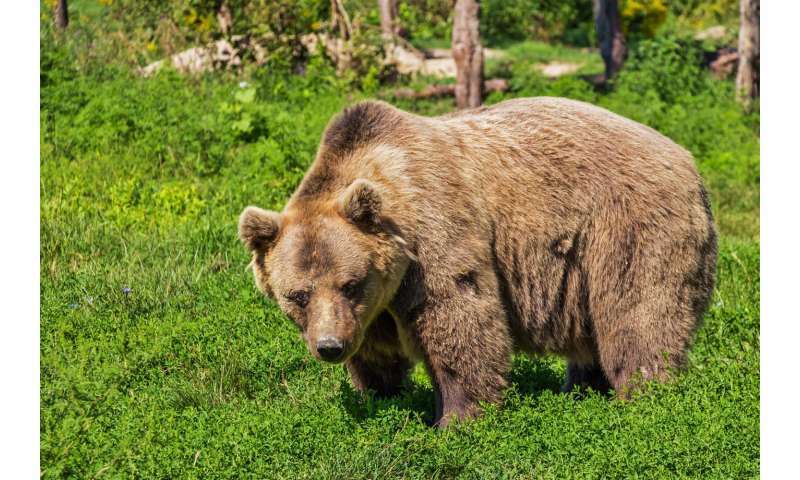 To learn more about possible chemical signaling in brown bears, the researchers began by examining skin samples from two bears—one in the wild and one from a zoo. They found that the bears had glands in their feet that secreted chemicals that could be released when the feet were twisted on the ground. Upon examining the secreted chemicals, the researchers found 20 compounds suitable for use in communicating information such as gender, readiness for mating, etc. To better understand how the bears might use chemical signaling, the researchers watched and filmed wild bears living in the mountains of southern Poland from 2014 to 2016. They also filmed bears living in the mountains in Spain over the course of a three-year period. In looking at the film the researchers report that they observed bears intentionally twisting their feet on the ground as they walked in certain instances—a move that would likely release the secreted chemicals to the ground. They also found that many of the bears would retrace steps they had taken before, carefully placing their feet into the prints they had left behind—perhaps updating their profile. In some cases, multiple twistings over time had led to bare patches of ground that presumably would serve as listening posts for other bears who happened upon them. They also report that males appeared to engage in feet twisting more than females.